October 2017 | AVB Inc. This Falls Most Frequently Asked Question, Answered. We are excited to announce several new businesses coming to Corner Shoppes @ Drake, located within our Costco-anchored development. Firehouse Subs, which opened in May of 2017, has enjoyed a great start. Additional new businesses coming soon include SVS Vision, Orangetheory Fitness, and Drake Road Tap House! For more information about Corner @ Drake, please contact Curt Aardema at 269.329.3656 or via email at caardema@avbinc.com. Construction is underway at the newest addition to our Costco-anchored retail development, Corner @ Drake. Corner Shoppes @ Stadium will consist of two buildings, encompassing over 20,000 square feet of restaurant and retail space. Situated along Stadium Drive, the new buildings will feature excellent visibility with a mix of in-line and end-cap suites available for lease. Both buildings offer great access to the entire Corner@Drake development. Completion of Corner Shoppes @ Stadium is scheduled for spring of 2018. For more information about Corner Shoppes @ Stadium, please contact Curt Aardema at 269.329.3656 or via email at caardema@avbinc.com. Whisper Rock, located adjacent to the Gourdneck State Forest near the intersection of Oakland Drive and Centre Avenue, will be opening phase II in January. The professionally designed entry and boulevards as well as the variety of home views including water, wetlands and forest make this community one of a kind. 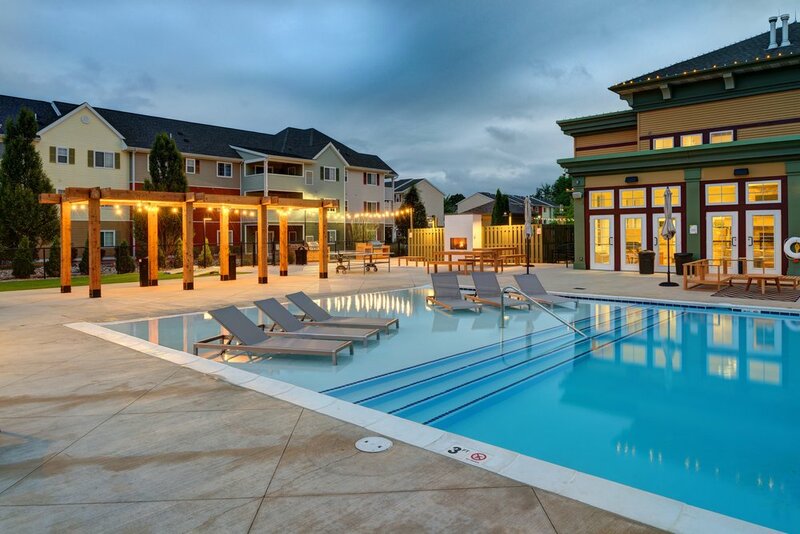 It also features a resort style community pool and cabana house. This fall, we broke ground with Mercantile Bank to celebrate their new branch. Located near the Centre Avenue and Oakland Drive intersection, this new branch will join one other Mercantile Bank branch within the City of Portage. It will also mark the sixth branch to join the Kalamazoo region. Featuring 3,880 square feet as well as a drive-thru, and ATM, this new branch is scheduled for completion in spring of 2018. For more details, please contact Jack Michael at 269.329.3612 or via email at jmichael@avbinc.com. 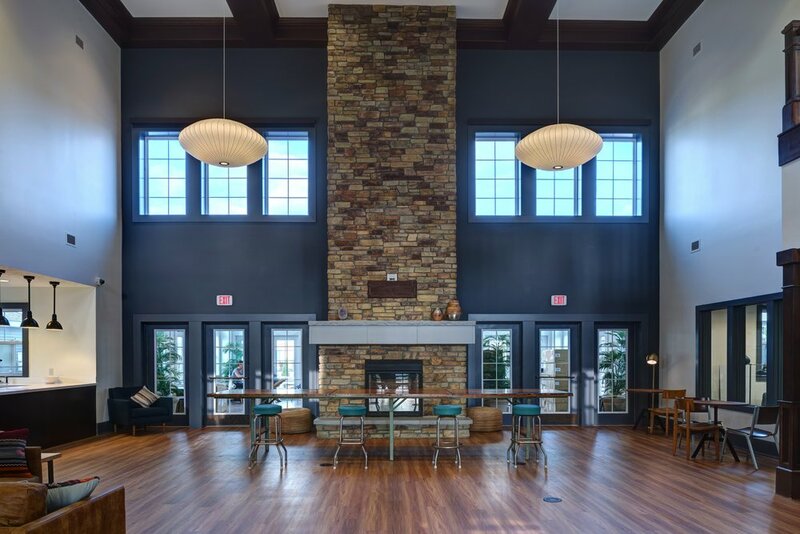 Located across from Grand Valley State University, The Village at 48 West is a student community that features the best in student living. 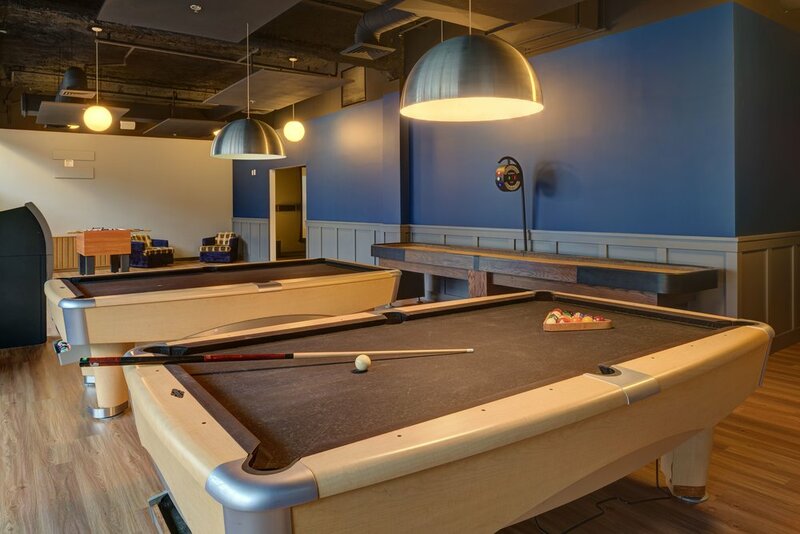 This year, new residents will be welcomed with new amenities, including a brand new pool, theater, game room, commons building, and gym. This project took place over just four months, being completed within budget and on time for this fall semesters new student arrival. For more information regarding this project or similar projects, please contact Jack Michael at 269.329.3612 or via email at jmichael@avbinc.com. In short, we do it with you! Designing a custom home is an evolutionary process and we have a very talented and experienced team of home designers, interior coordinators, architects and Computer Aided Designers (CAD) that will guide you through designing a home that matches your lifestyle and your budget. By designing for your lifestyle, we are able to take your dream home ideas and make them come to life. Weather we start designing with one of our portfolio floor plans or from a blank piece of paper, we will marry your dream home to your home site. To find out more about building your home with AVB, contact Katie vanLonkhuyzen at 269.329.3652 or via email at katie@avbinc.com. AVB was founded in 1981. Our original logo is shown on the side of a residential customer service truck. Woodbridge Hills, one of AVB’s 1st development projects, opened in 1979. AVB’s founding principals Joe Gesmundo & Daryl Rynd from a 1991 feature in “Business Digest” magazine. Borgess Brain & Spine Institute, opened in 2006, is one of many Borgess projects completed over the last 30 years. 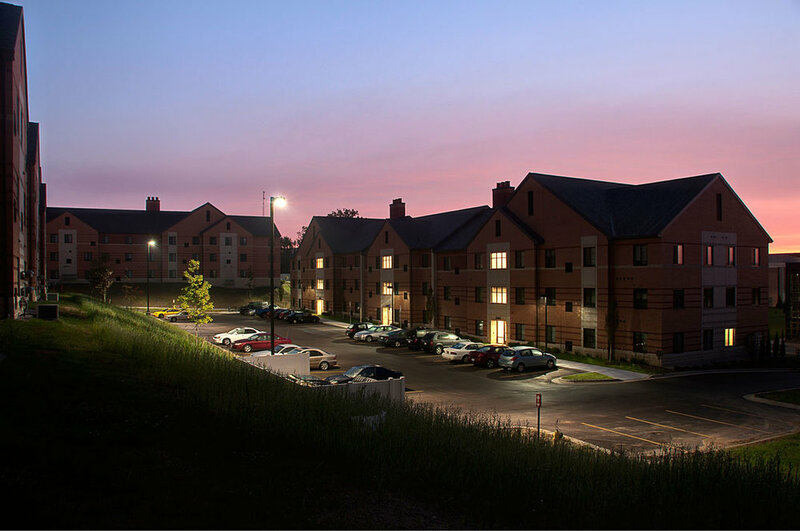 AVB completed WMU’s LEED Certified Western View Apartments in 2013 . Today, AVB’s commercial division represents approximately 50% of it’s business by sales value. AVB’s current logo was introduced in 2013. 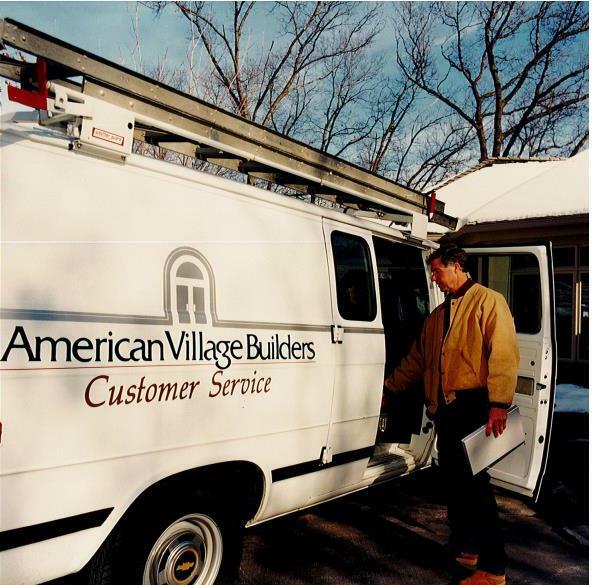 AVB’s 85 team members are focused on commercial & residential construction & development. AVB’s current principal team, from left, Greg Dobson, Daryl Rynd, Joe Gesmundo, and Jack Gesmundo. This custom home was completed in 2016. AVB continues it’s tradition of excellence in building custom homes & condominiums.